Remington filtered cigars are designed to provide the smoker with an outstanding delivery, ease of use and exceptional taste. Remington filtered cigars outperform many cigars based upon their low price while offering a great tasting filtered cigar. 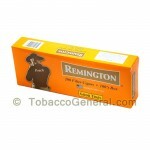 Tobacco General offers flavors of Remington filtered cigars such as full flavor, strawberry and lights. Remington cigars are always high in quality and low on pricing to satisfy the customer’s top level demand! 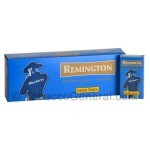 Remington Filtered Cigars Blueberry are a great on the go smoke and use a select blend of filler tobaccos. Remington Filtered Cigars Full Flavor are a great on the go smoke and use a select blend of filler tobaccos. Remington Filtered Cigars Strawberry are a great on the go smoke and use a select blend of filler tobaccos. Remington Filtered Cigars Menthol are a great on the go smoke and use a select blend of filler tobaccos. 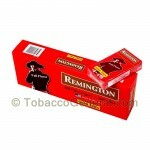 Remington Filtered Cigars Cherry are a great on the go smoke and use a select blend of filler tobaccos. Remington Filtered Cigars Lights are a great on the go smoke and use a select blend of filler tobaccos. Remington Filtered Cigars White Grape are a great on the go smoke and use a select blend of filler tobaccos. Remington Filtered Cigars are a great on the go smoke and use a select blend of filler tobaccos.